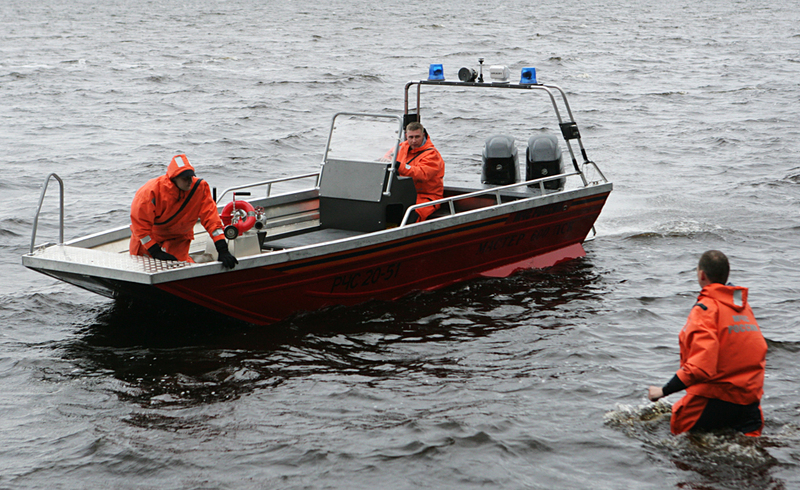 Rescuers on the Lake Syamozero in Karelia, June 19, 2016. A criminal investigation has been launched in Russia's Karelia Republic against a paramedic who ignored a phone call from a child in the accident zone on Lake Syamozero, Russian Investigative Committee spokesman Vladimir Markin told Interfax on June 24. "The Russian Investigative Committee's investigation agencies for the Republic of Karelia have opened a criminal case against a paramedic from the Republican Central Hospital's ambulance service. She is suspected of committing a crime under Article 293 [negligence] of the Russian Penal Code," Markin said. The female paramedic, who was on duty on June 18, received an emergency phone call from a child in the accident zone saying that boats carrying children had capsized on Lake Syamozero in Karelia's Pryazhinsky district and that the children's lives were in danger, he said. The paramedic's failure to respond to this phone call did not allow rescue services to immediately launch a rescue operation, thus leading to children's deaths. The suspect ignored this phone call, did not notify the hospital's administration, police and the Emergency Situations Ministry's regional department and did not include it in the ambulance service's call log, Markin said. Necessary investigative measures are now underway to establish all circumstances of the offence and collect the required evidence, he said. The woman has been detained and investigators will soon ask a local court to remand her in custody as a restraining measure. The criminal investigation continues. Children from the Park-Hotel Syamozero camp ran into a storm while boating on Lake Syamozero, in the Pryazhinsky district of Karelia, on June 18. There were 47 children and four adult instructors in three boats. Two of the boats overturned and sank in the storm. People from the capsized boats attempted to swim up to the lake shore, but not all of them managed to do so due to high waves and the low water temperature. Thirteen children drowned. Their bodies have been found. One child is still being searched for.